Sandra Mae Frank and Austin P. McKenzie in Spring Awakening. Duncan Sheik and Steven Sater's Spring Awakening burst on the stage of the O'Neill in 2006 with explosive force, a generational protest piece that took a long-censored, 1891 German play and smashed it into Rock 'n' Roll. The show was a bolt of lightning for Broadway, illuminating the field in the same way that Hair did in 1968 and Hamilton is doing today. Here we are less than nine years later, and only six years since the original closed, with an all-new production of Spring Awakening. Same songs, same script and newly staged in something of the same style. Yesterday's Spring Awakening was a seismic jolt, with a visceral effect on the audience. 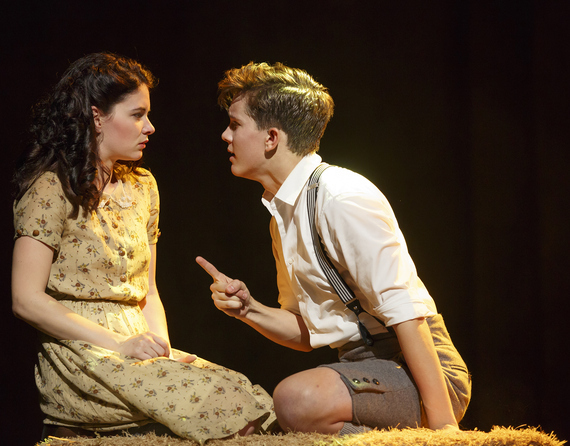 Today's Spring Awakening is a worthy production of the show, but that's it. You left the original production wanting to tell friends they had to see it, just like Hamilton today; you are likely to leave this one saying it's fine, especially if you've always wanted to see Spring Awakening. Not the same thing. This production originated at Deaf West Theatre in Los Angeles, the group that brought an effective revival of Big River to Broadway in 2003. The entire company signs the performance in ASL (American Sign Language), including the speaking actors within the cast. Two of the three leads -- Wendla (Sandra Mae Frank) and Moritz (Daniel N. Durant) -- have guitarists who shadow them and speak/sing their lines; other non-speaking actors, most prominent of whom is Oscar-winner Marlee Matlin from "Children of a Lesser God," are voiced by assorted cast members. This works quite well, mostly; Ms. Frank and her voice (Katie Boeck) make an effective combination, and as a bonus share a playful interplay. Something about the pairing of Durant and Alex Boniello seems off, though. This Moritz does not embody the show's angst as the character did in 2006 (with John Gallagher, Jr. winning a Tony Award in the process). Durant's signing seems to separate him from his character, which decidedly doesn't happen with Frank, Treshelle Edmond (as Martha, the girl with an abusive father), Russell Harvard (as the father of Moritz) or Matlin. The most winning performance comes from Austin P. McKenzie as Melchior. Like Frank and Durant he is making his Broadway debut; he was in college studying Childhood Education and ASL when he got the gig in Deaf West's Los Angeles production. Not only does he play his role well; his facility with ASL makes him a bridge between the two halves of the company in the same way that his character leads the others. 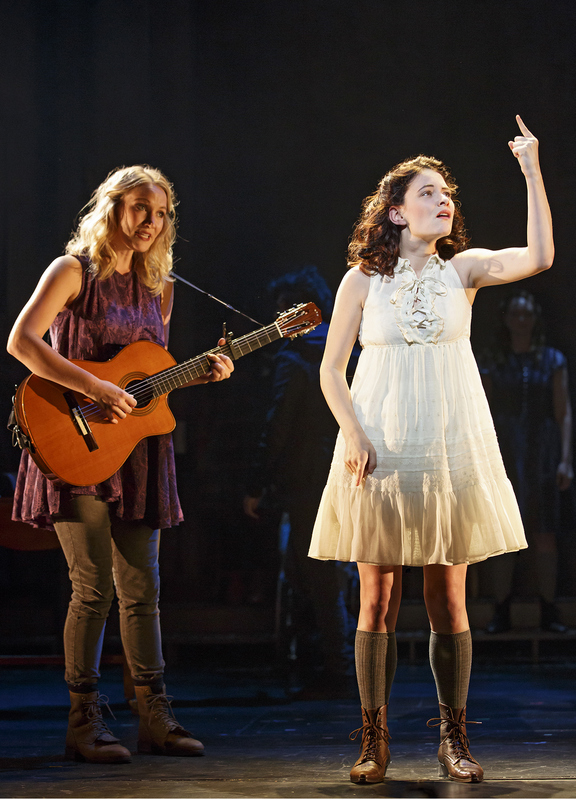 Kathryn Gallagher, Krysta Rodriguez and Alexandra Winter in Spring Awakening. 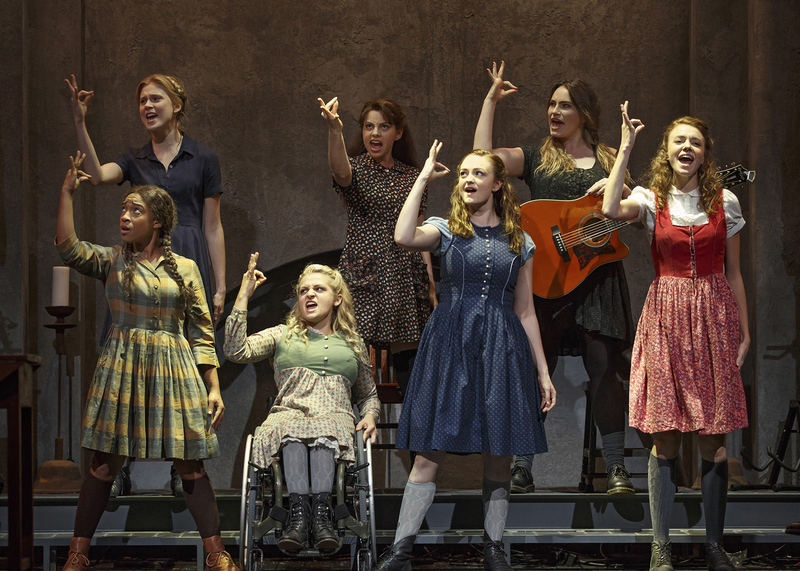 There is no reason that a vibrant 2006 musical about wretchedly mistreated youth (circa 1890) should not have the same effect in 2015, and Spring Awakening remains formidable. But the original production was slashingly vibrant, with a power that reached across the footlights and grabbed the audience. Today's Spring Awakening doesn't, and one wonders whether it's the production or merely the changing times less than a decade later.